After sitting at my craft desk for many hours with a crafting block and panicking that I'd lost my MoJo this is what I came up with. It was the punch that inspired me, I just punched out the shape from a piece of black card and slowly I started to build up the image of what I wanted. 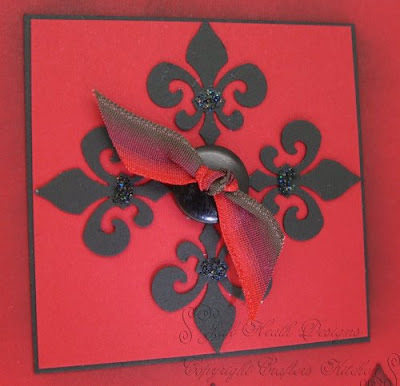 I punched four more Fleur De Li's from black card stock and arranged them onto a square of red card stock I used a black button and tied red and black ribbon and knotted it at the front of the button. I added black diamond stickles glitter glue to accent the shapes then matted and layered onto a piece of black card to form a frame. 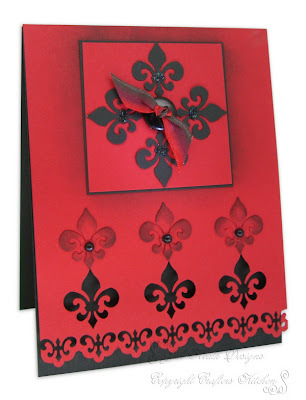 Attention to detail; the punched red shapes that popped out of the card have been sponged with black ink and added above the punched Fleur De Li's holes to mirror the image, the black pearls were added to the red sponged shapes. If you are wondering where the black pearls came from well I have to admit to cheating, I only had normal pearl colours but used a permanent black marker to colour them. oh that is beautiful, no loss of mojo there hunny!! omg, jak, this is one of the most beautiful things I have ever seen...all with a punch! Holy cow! OH, this is a dream of card! I love your punching! Very dramatic, I wish when I lost my mojo I could create something like that. Gorgeous card and simple too, I love it! Such a beautiful card Jak. Love the black and red, looks really expensive. I'm glad your Mojo returned. Don't admit to cheating Jak, call it ingenuity - it always works for me, lol! Beautiful card again. Card and colours are stunning Jak. Absolutely gorgeous Jak, I love it. Wish i could be so clever with punches. Jak - how cool is that!!!!! Awesome! This is first time I visited in your blog....but what a great blog...and awesome cards...just beutiful..
Jak, what a beautiful card and I just love the red and black. You definitely still have your mojo. Have a great weekend. This is gorgeous! 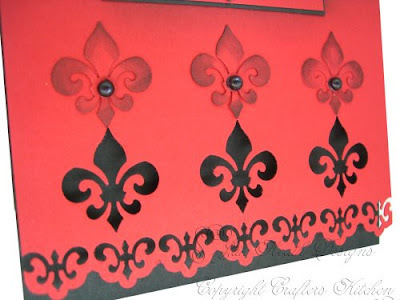 Uses my two favorite colors and I love Fleur De Li's. You haven't lost your MoJo that is for sure. I lost mine though and have yet to find it anywhere. lol.